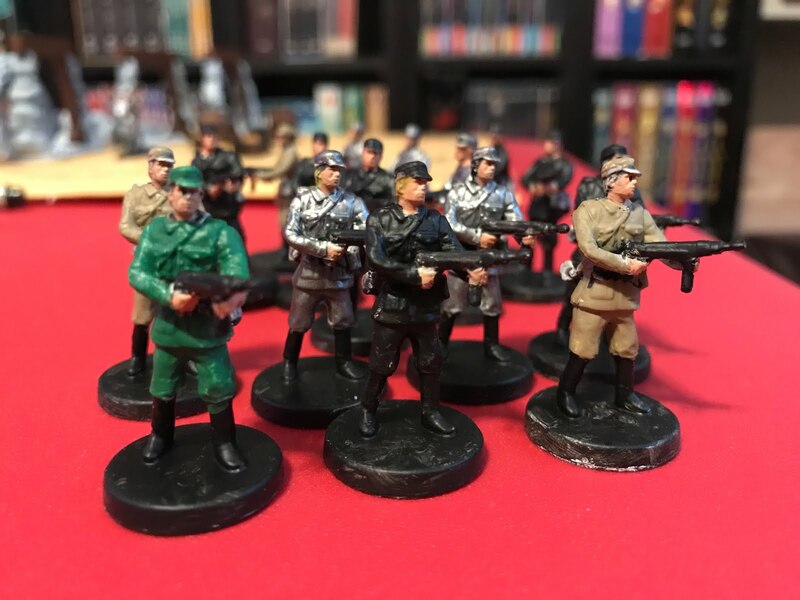 By painting this assortment of WWII German troops, I have finished painting all of the pieces for Fortune and Glory, in plenty of time for the next Gaming and Guinness. As you can see, I experimented with different uniform colours. I Googled "German infantry World War 2" and got a whole bunch of different results. So I made some tan, black, grey (that turned out more like silver), and one green plastic Nazi. The tan ones are sort of cool, the black nice and sinister, but the grey/silver ones show off the most detail. The green one just doesn't feel right at all. All in all, though, I think these turned out pretty well. These look great! I probably would have gone with a 'uniform' colour for easier recognition on the board, but the variety is certainly appealing. To make the olive grey you need for military garb, you mix in a little bit of dull yellow or orange and a tiny dab of red. That will make the green less punchy, should you decide to repaint. If the colour gets too light add some dark blue bit by bit to make the uniform darken.